Yesterday saw the Boots Shapers Turkey, Stuffing & Redcurrant sarnie but today is a new day and this calls for a new festive delight. 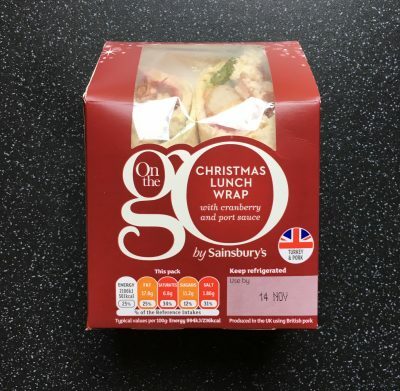 Waitrose were by far my king of festive sarnies last year and I must have consumed enough to cover anybody who didn’t partake. I have been an eager beaver for these to arrive in store and to see if it varied from last year, and indeed it has. 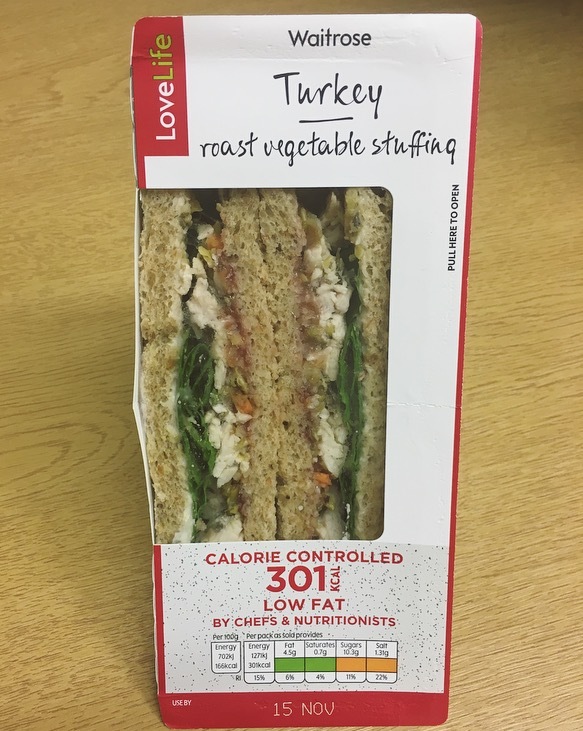 Enter this years sarnie – Waitrose Love Life Turkey and Roast Vegetable Stuffing. 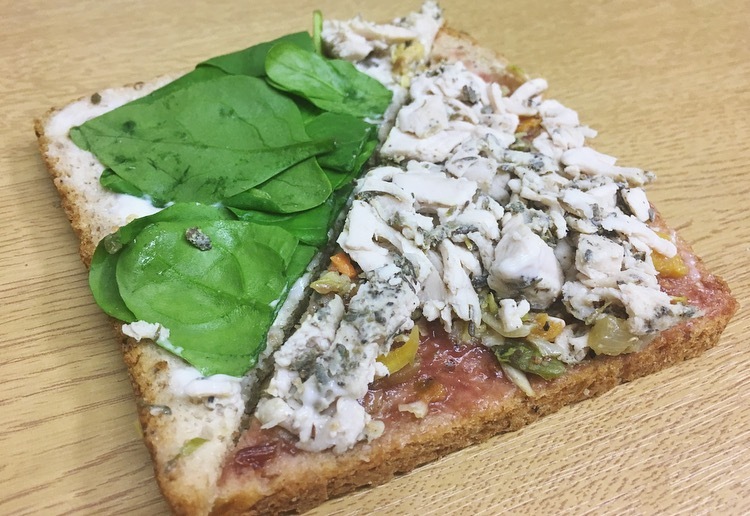 This is quite the interesting choice of veg and to be honest I was very hesitant to buy something with chunky vegetable stuffing wanged into two pieces of bread. But a girl has got to do what a girl has got to do, and took one for the team. 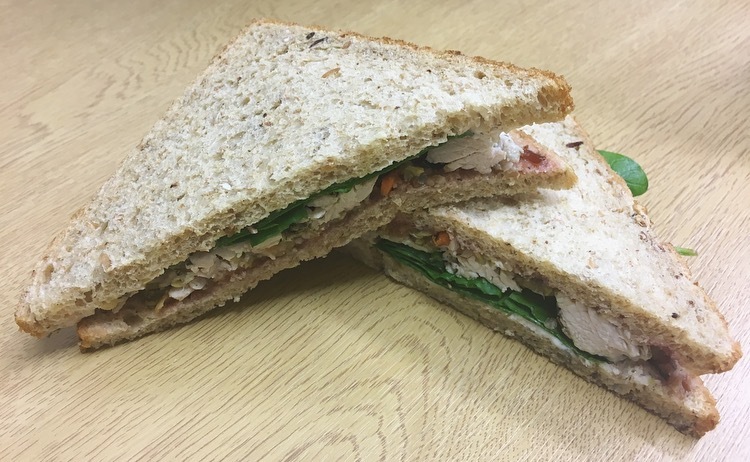 Shredded sage and thyme turkey, roast vegetable stuffing, cranberry and orange sauce, spinach and mayonnaise on malted bread. Average in price at £2.80 however Waitrose appear not to do a meal deal so it all adds up once you add a few accompaniments. Per pack: 301 kcal, 0.7g sat fat, 10.3g sugar, 21.7g protein. For a controlled sarnie the filling was certainly there and I loved that the turkey was in smaller chunks so you got a bit in every bite. The vegetables were soft, sweet and a wee bit strange. Although they were small enough I couldn’t help but think it didn’t really belong in a sandwich. The chutney had the right balance of sweetness from the orange and tartness from the cranberry and thankfully wasn’t overpowering. The spinach, well that got launched, I still don’t think spinach is a necessary component but these supermarkets are persisting. The addition of mayonnaise was a smart move and took the edge off the stuffing and chutney and ensured there was no dryness in sight. 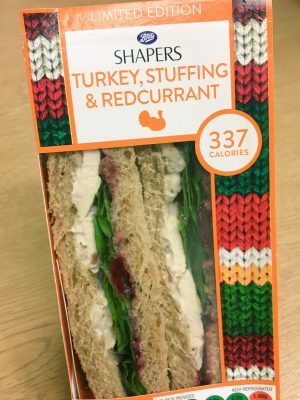 Waitrose Love Life Turkey and Vegetable Stuffing is a good sarnie if you are watching the waistline before Christmas. Still I am baffled by forgoing the traditional stuffing and opting for a vegetable stuffing, I am all for change but chunky veg is a step too far. Sadly unlike last year this isn’t the one that I keep hankering for every lunch time.